Thanks for stopping by. 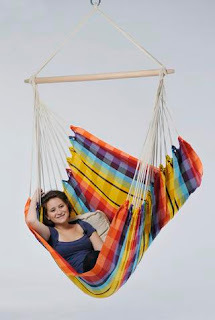 Today's news regards a funky new style of hanging chair, something a little out of the ordinary. The Belize really is a seat suspended from ropes, as you can see from the photos. It comes in Vulcano or Sand colourways, and is already proving very popular, so if you want to know what all the fuss is about, give us a call on 0208 123 0557 or check out Hammock Heaven today for details. 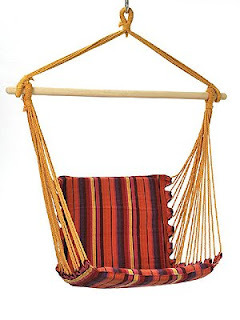 If you like what you see you can be relaxing in your very own Belize hanging chair tomorrow! Its been a while since I promised you new exciting developments in the Hammock Heaven world, but whilst it may seem like I've just been sitting around in comfort all day, in reality we've been snowed under (ironically!) with orders as the sun has shown his cheery face after a long long winter! There are more newcomers to the site yet to be unveiled, but for now I'd like to draw your attention to some new hanging chairs...the Brasil Hanging Chair range has been updated with some great new colours. But there are plenty of others, so if you don't agree there are bound to be others you like instead. 'Til next time, hope you are enjoying the sun!